Edmonton’s award-winning urban art exhibition, #YEGCanvas, returns to enliven Edmonton’s cityscape with 45 new artworks by 38 Edmonton artists from November 2016 until April 2017. Developed by the Edmonton Arts Council in partnership with Pattison Outdoor Advertising, #YEGCanvas; a citywide billboard and LRT station-based art exhibition, features art spanning a diversity of genres and disciplines including digital media, ceramics, photography, watercolour, acrylic, drawing, and fine craft. November 7, 2016. Edmonton’s award-winning urban art exhibition, #YEGCanvas, returns to enliven Edmonton’s cityscape with 45 new artworks by 38 Edmonton artists from November 2016 until April 2017. 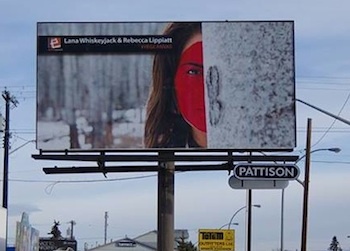 Developed by the Edmonton Arts Council in partnership with Pattison Outdoor Advertising, #YEGCanvas; a citywide billboard and LRT station-based art exhibition, features art spanning a diversity of genres and disciplines including digital media, ceramics, photography, watercolour, acrylic, drawing, and fine craft. Artworks were chosen from more than 120 submissions. Over the next six months, the artworks will be displayed on 10 billboards, located throughout the city, and on 15 LRT station posters along the capital and metro lines. The art will be rotated every two months. #YEGCanvas is a jumping off point for artists who have had limited opportunity to participate in public art or exhibit in the Edmonton area. It became one of the largest campaigns in Pattison Outdoor Advertising’s history. The Edmonton Arts Council and Pattison Outdoor Advertising will launch #YEGCanvas Monday afternoon in the Willow Room at Boyle Street Plaza.